In celebration of World Photography Day, ASUS, the Taiwanese leader in mobile technology is excited to announce ZenFone Zoom S, the world’s slimmest and lightest 5.5-inch smartphone with a 2.3X Optical and 12 X Digital Zoom, Dual Camera setup that delivers photographic perfection. With a high-capacity 5000mAh battery onboard, you can immerse yourself in a photo-adventure that can last up to 2 days continuously on a single charge. The ZenFone Zoom S will be launched exclusively on Flipkart - India's biggest online store. ZenFone Zoom S’ innovative dual-camera system consists of two cameras: A main camera with an f/1.7-aperture, 25mm wide-angle main lens paired to a 12MP SONY IMX362 sensor with large 1.4µm pixels (1/2.55in sensor size); and a dedicated 59mm, 12MP zoom camera with an instant 2.3X true optical zoom and 12X of total zoom. This setup ensures sharp focus on subjects at any distance. ZenFone Zoom S also has the first ASUS SuperPixel Camera that enables it to shoot photos quickly and clearly in night-time or in low-light environments. The SuperPixel Camera combines advanced hardware and software enhancement by ASUS SuperPixel™ technology to achieve light sensitivity that is 2.5 times(2.5X) greater than that of the Apple® iPhone® 7 Plus, and 10X that of an average smartphone. The ZenFone Zoom S also features Optical Image Stabilization (OIS) and Electronic Image Stabilization (EIS) for photos and 4K videos. The ZenFone Zoom S houses an incredible 5000mAh battery that has a much higher capacity than that of an average smartphone. This is paired to a powerful yet energy-efficient Qualcomm® Snapdragon™ 625 14nm processor, enabling it to achieve an amazing 6.4 hours of continuous 4K UHD video recording and an outstanding 42 days of standby time. The high-capacity battery also gives ZenFone Zoom S the ability to double up as a power bank to charge other devices. 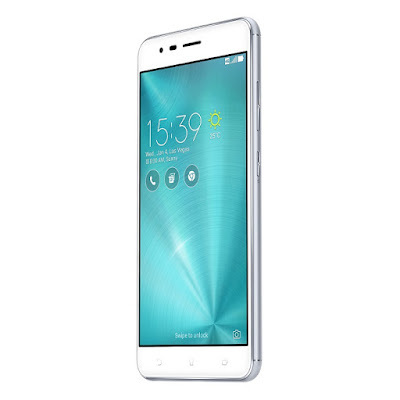 Remarkably, the high power density of the battery allows it to be fitted into a super-slim, 7.9mm full-metal chassis that only weighs a mere 170 grams, making it the world’s thinnest and lightest 5.5-inch smartphone sporting a Dual Camera setup with 5000mAh battery. High-resolution SuperPixel selfies — ZenFone Zoom S features one of the best high-resolution front-facing cameras of any smartphone. It has a 13MP SONY IMX214 sensor with an f/2.0 aperture lens that shoots high-resolution selfies and also benefits from ASUS SuperPixel technology to achieve twice the light sensitivity. It also features a new ‘screen flash’ mode that uses the display as a flash in low-light environments. 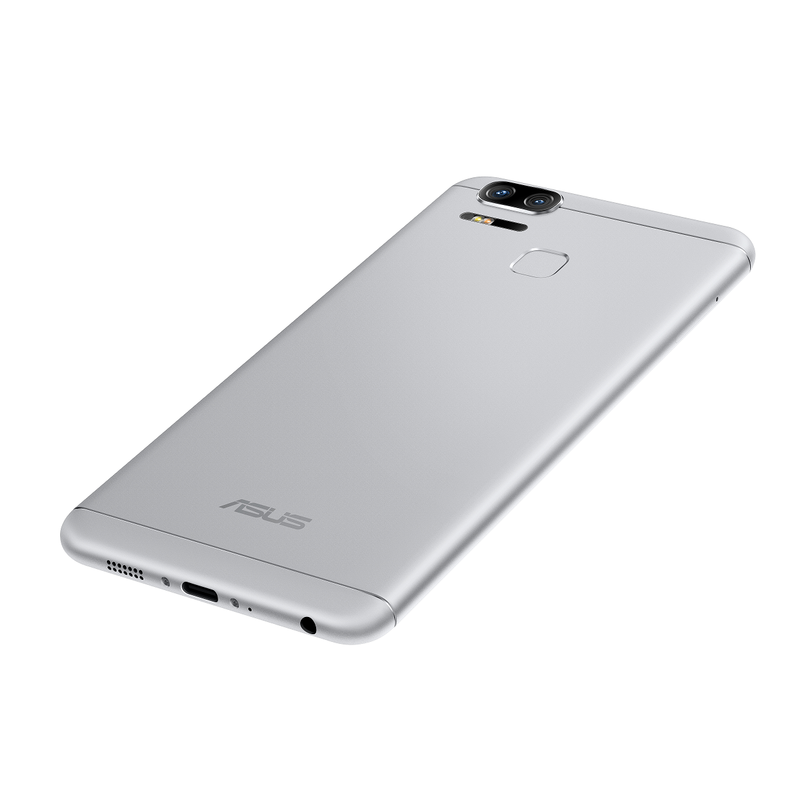 ASUS 0.03s TriTech+ autofocus — ZenFone Zoom S has an improved ASUS TriTech+™ autofocus system with new Dual Pixel PDAF technology as one of its three focusing technologies along with the second-generation laser autofocus and subject tracking autofocus. ASUS TriTech+ automatically chooses the best technology to use depending on the subject, and achieves focus in an amazingly fast 0.03 seconds. RAW File Support — ZenFone Zoom S offers photographers the freedom to shoot and store compositions in RAW format. RAW files save the full data of the photo captured by the camera’s sensor and is ideal for enhancing them with editing software, where users are able to uncover fine details in areas of shadow, or recover overexposed areas in the highlights, with much less degradation in the image quality when compared to editing JPEG image files. RAW support will be available with the Android 7.0 ‘Nougat’ FOTA upgrade. Full Manual mode — This mode enables full control over ZenFone Zoom S’ extensive camera settings. These includes white balance, exposure value (EV), focus, and ISO settings, and an impressive shutter-speed selection starting from 1/16000 sec to a maximum of 32 seconds. In ZenFone Zoom S, this mode also allows users to override the automatic camera selection and choose to use the 25mm, f/1.7 lens of the main camera or the 59mm lens of the zoom camera. Continuous Autofocus 4K UHD Video Recording — For impressive video recording, ZenFone Zoom S shoots videos at 4K (3840x2160) at 30 frames per second, along with the subject tracking autofocus system allowing the smartphone to continuously focus on subjects. With an incredible battery capacity 5000mAh, ZenFone Zoom S has one of the highest capacities of any smartphone — and the world’s highest capacity in its class. Paired with the powerful yet battery-efficient 14nm Qualcomm Snapdragon 625 processor, this high-capacity battery enables ZenFone Zoom S to achieve an amazing 6.4 hours of continuous 4K UHD video recording time, or 42 days of standby time, without worrying about running out of charge. 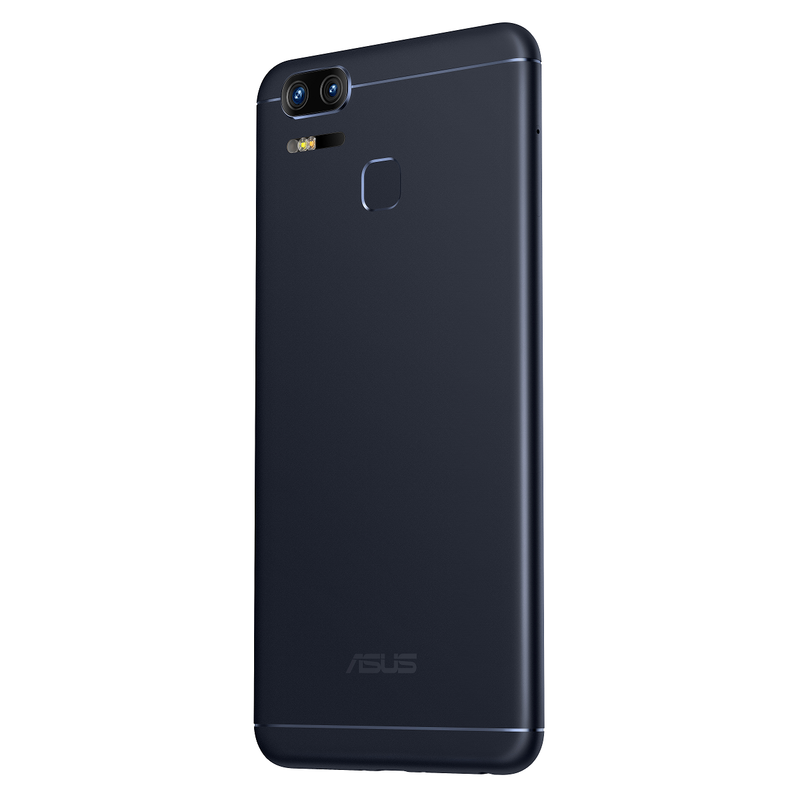 ZenFone Zoom S’s high battery capacity also lets it double up as a high-speed power bank for charging other devices via an automatic reverse-charging capability. ZenFone Zoom S is also one of the first few smartphones to have a Corning® Gorilla® Glass 5 display cover panel that is 70%-more resistant to drop damage compared to the previous Gorilla Glass generation. This panel has been crafted and shaped to fit within the phone’s beautifully small, sandblasted aluminum-alloy body. The ZenFone Zoom S features one of the best audio experiences that you can find on a smartphone today. It features a 5-Magnet speaker that is boosted by an NXP SmartAMP to give you Clear, Crisp and Full Sound even at loud volume levels. For headphone audio, the ZenFone Zoom S is HiRes certified, meaning it can playback lossless audio formats with ease at 192kHz/24-bit, which by the way is 4X better audio quality than CD Audio. To add to the surreal audio immersion, the device also features DTS Headphone:X, which recreates your content in a virtual 7.1ch Surround Sound effect over headphones. You can further customize audio with the built-in AudioWizard app to suit any audio scenario, and also can smartly switch between audio profiles based on the content you’re currently listening to. 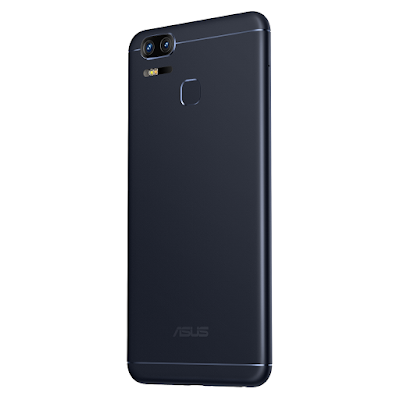 ZenFone Zoom S features a full metal body construction is the world’s slimmest and lightest 5.5-inch 5000mAh smartphone, and is a mere 7.9mm thin and weighs just 170 grams. The body features a finely sand-blasted finish for a more refined and a premium grip. On the sides, it features smooth curved ergonomics for a comfortable feel. At the back, the ZenFone Zoom S features a fingerprint sensor that can unlock the device in 360 degrees, supports 5 finger recognition, and you can receive calls directly by swiping the registered finger directly at the lock screen. The device is available in impressive 2 colours – Navy Black & Glacier Silver. ASUS ZenFone Zoom S priced at INR 26,999/- will be available exclusively on Flipkart.